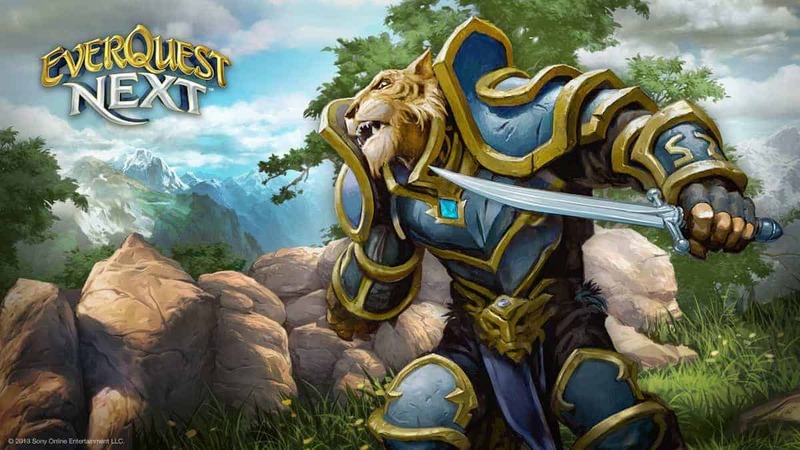 We now have details on the first four EverQuest Next Classes featured in the upcoming MMO role-playing game from Sony Online Entertainment, courtesy of the latest issue of PC Gamer. They are Cleric, Necromancer, Beast Lord and Tempest. Cleric – Wields either a two-handed hammer or a hammer and shield. Buffing and protecting allies is the typical Clerical duty, but these magic men and women do it with the power of fire, which gives them some killing power, too. Necromancer – Wielding a tome or a dagger and focus object, the Necromancer summons destructive chaotic energies and comes with a companion: a Monstrosity that grows in power with its master. Beast Lord – If you’re a fan of ‘trampling’ and ‘savaging,’ the Beast Lord’s furry friends make excellent companions. You can do your own savagin, too, with a flail and shield combination, or a spear for medium range attacks. Tempest – With two blades or one two-handed blade, the Tempest ‘dances across the battlefield’ and unleashes powerful winds and blasts of lightning. Ought to appeal to fans of action RPGs. While all the four mentioned classes relish in the use of magical abilities and melee weapons; the next set of official reveals may include more classes that specialize in ranged combat. EverQuest Next was officially unveiled earlier this summer along with its companion creation game, EverQuest Next Landmark. The game is set to launch for Windows PC and possibly PlayStation 4 next year.